A welder joins things together with metals. You will use a variety of processes to complete your jobs. There are also quite a few different career options that you can get into that can touch land, sea, sky, and everything in between. Welders keep our nation’s structures, both old and new, standing proud and tall. You are needed in a variety of different industries; you will be able to go from one field of work to another. 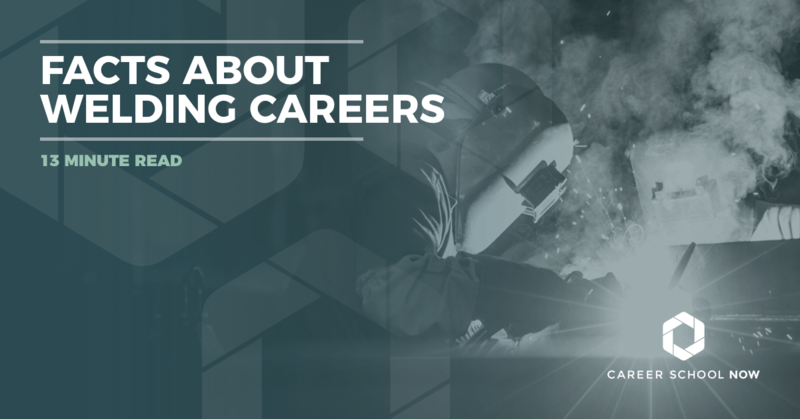 If welding is a career option you’re considering, read on to find out why welding is a good career choice. Find a local welding school. Depending on what industry you’ll work in will determine your scope of work. However, one thing welding has in common across all industries is that heat is used to fuse metal parts together. Tools, processes, and types of metals will vary as there are more than 100 actual processes welders use, with the most common type being arc welding. Welders need to have an in-depth understanding of blueprint readings and specifications so that they can accurately determine what is involved in their project. Focus and determination are key elements necessary to being a successful welder. You need to be extremely detail-oriented to assess the necessary repairs accurately, and to catch the change in the flow of the liquid metal being used to join parts. You should have higher than average manual dexterity and physical stamina, as well as physical strength. Think about it, as a welder you are sometimes stuck in one position, holding heavy equipment, for extended periods of time. You need to be able to sustain that without fail, or the project may flop. Students are graduating from four-year colleges and having a hard time finding jobs. In the welding industry, there is a massive shortage of qualified welders. Since 1988, the number of working welders has decreased by half, and that number is shrinking rapidly. The main reason for this shortage of welders is that the sum of those retiring is not equal to those entering the workforce. Welding is being underrepresented and yet welders are necessary to our nation’s infrastructure. By 2020, the shortage of skilled welders is estimated to be 300,000. Take a FREE certified Welder practice test. Either graduate high school or obtain your GED. After that, the requirements may vary by employer. Some will offer apprenticeships and training programs. Most employers suggest, at the very minimum, a trade school diploma in welding. Community colleges offer associate’s degrees in welding technology. With both types of programs you will take physics, chemistry, blueprint reading, metallurgy, mechanical drawing, and shop math. You’ll also learn the essential art of heating and shape various metals, which welding is based upon. There will also be plenty of hands-on opportunities which will not only teach but give you the necessary exposure to experience, as well. You can also further your already established welding career. Choosing a welding school doesn’t have to be an impossible chore. One way to help make your decision easier is to go to a local company that employs welders and find out where they went. Maybe ask them some questions about their school experience, while you’re there. If doing that is out of your comfort zone, that’s ok. There are other steps you can take such as visiting the American Welding Society’s website to see what schools they recommend in your area or wherever you are choosing to go to school. Other things to check out when school searching is whether they are accredited, what their graduation rate is, and what their job placement program is like, assuming they have one. You may also want to consider setting up a time to do a classroom visit, to see what you’re getting into! While you’re snooping around, notice the machinery. Is there enough for each student? Are they in decent condition? Ask the students; they’ll tell you what their experience is. Keep in mind; some people don’t like going to school, no matter what program they are in, so they might have a negative attitude toward it. Therefore, asking a few different students their opinions will give a better idea. Three of the largest welding schools are Tulsa Welding School, Hobart Institute of Welding Technology, and Lincoln Welding Training. And there's plenty of room for career advancement in Welding! There are a couple of different ways to obtain your welding education. Formal and informal apprenticeships are decent options. And, there is the trade school or community college option, as well. Apprenticeships can be free or have a nominal cost, roughly $1,300 and will last 3-5 years before you’re ready to go on your own. A four-year bachelor’s degree in welding technology will cost between $40,000-$100,000. The two more traditional ways to become a welder are through either a diploma or associate’s degree programs. One of the main differences between the two programs is that an associate’s degree will include general education courses with the credits needed for graduation varying depending on the school. Diploma or certificate programs focus on welding, period. However, with an associate’s degree, you have the option of continuing to receive a bachelor’s degree in welding technology. Of course, educational costs and their supplemental costs depend on which school and where it’s located. It is possible to receive scholarships and financial aid to offset the cost of the welding education, so it’s important to discuss options with the financial department of the school. Find out more about financial aid. The American Welding Society offers quite a few scholarship opportunities, and you can learn more about them on their website. Welding will experience a slow employment growth of five percent through 2026. Sure, this is slower than most other occupations but do not be discouraged if you’re thinking about going into welding because there is still a high need for welders as our nation’s infrastructure ages. Most welding jobs are found in the manufacturing sector with a concentration in transportation equipment, fabricated metal products, agricultural, mining, and farming machinery, and architectural and structural metals manufacturing. Welders who aren’t up to date in their training will find it hard to find a job because of how competitive the job market will be. Welders earn a median annual wage of $39,390. The lowest ten percent made $26,800 while the top ten percent brought in more than $62,000 annually. Pay is determined by various measures such as skill, which industry the welder is in, and the size of the company. Not all states require welders to be certified. However, to be more employable, certification is highly recommended. Certification verifies to potential employers and customers that the welder has the skills to complete the necessary tasks. It provides a level of reassurance to employers that their work reputation isn’t at stake. Certification also means a larger paycheck and better job advancements for you, the certified welder. There are quite a few different certifications available to welders and, depending on what kind of welding work the welder is looking to do will determine which certification is needed. They cost between $275-$1,100 depending on which certification is being pursued. American Welding Society: The AWS offers nine different areas of certifications. You can get certified as a welder, a welding instructor, or in certified robotic arc welding. Becoming a member of the AWS will lower the prices of the certification exams. Senior Certified Welding Inspectors are similar to Certified Welding Inspectors but they are at a more advanced level. They have a better understanding of advanced NDE topics, quality systems, and procedure qualifications. Applicants must have a minimum of 15 years work experience with direct relationship to welding or with direct involvement in two or more areas of welding inspection. Welding Educators understand the welding process, instruction plans and evaluate students who are taking a welding process class. They understand the basic requirements of becoming a certified welder and the welder qualifications. They can read drawings and examinations, prepare records and develop reports. Certified Radiographic Interpreters assess welding related indications and procedures on radiographic film and related media. The program will help you learn proper film exposure, image quality and follow the AWS, API, and ASME codes. Certified Radiographic Interpreter learns properties of x and gamma radiation, photographic assets, radiation safety principles, calculations, application to welds, welding technology and effects of equipment from radiographs. At least 1 year of experience as a company certified individual in radiographic interpretation or performance. Certified Welding Supervisors can save up to $17,000 per welder per year. They increase quality and production, reduce welding costs and maximize profits and increase safety. Certified Welding Supervisors overlook welders work and the process to increase productivity and improve quality welding throughout a business. Certified Welding Engineers are familiar with written instructions and codes of the welded joints process and production. They also are familiar with specifications, standards and other rules of the assembly process of welding. Their job begins before production of welding and continues through the production process. The American Society of Mechanical Engineers: For welders who work with boilers and pressures, this certification ensures they know the codes and are qualified to work in this industry. A membership to the ASME hosts a plethora of benefits. The Nuclear Material Organization helps provide materials and services to the nuclear power industry. Nuclear Component type helps ensure persons or organizations performing quality assurance functions of identify quality problems, recommend or provide solutions through departmental channels, assure future processing, delivery, installation and satisfaction of conditions. They must also make sure that ensure design specifications are available for all components, are adequate and available to the ANI before fabrication begins. Nuclear Quality Assurance helps organizations supply items or services that provide safety for a nuclear facility. Is the leading standard on how to design and build equipment for the production of biopharmaceuticals and personal care products industry. This process helps with high levels of hygienic requirements.It incorporates current best - practices for enhancing a product's safety. Applies to stationary vessels used for storage, accumulation, or processing of corrosive or other substances. Pressures should not exceed 15 psi internal or external above any hydrostatic head. American Petroleum Institute: Part of the gas and oil industry since 1989, the API certification program oversees the welding codes for pipelines and a certification through them ensures the industry of the welder’s proficiency. Reduce the fees of the certification exams by becoming a member of API. The piping instructor helps provide a continued high level of safety, improve management control and reduce production delays. Above storage tanks Inspector inspect the safety and quality of tanks. They also repair damaged tanks and help assist state and local government regulations. Tank entry supervisors must have knowledge of aboveground petroleum tanks and construction. They must have knowledge of ventilation, tank decommissions isolation, work permitting, emergency response and tank recommissioning. Pipeline inspectors should be knowledgeable about general onshore pipeline construction inspection, inspector responsibilities, personnel and general pipeline safety and environmental and pollution control. Corrosion and materials certification are highly specialized inspectors, corrosion engineers, chemical engineers and other professionals across the petrochemical industry. Risk-based Inspection is quickly becoming one of the industry’s most premier instruments and preferred methods of control. Engineers and other professionals across the petrochemical industry have a higher understanding of this field. Refractory personnel is open to applications with any experience in petroleum and petrochemical industries. Must be knowledgeable in installation, inspection, testing and repair of refractory linings. Source inspector fIxed equipment is open to applicants with any experience in the petroleum and petrochemical industries. The source inspector has been defined as the individual responsible for examining fabricated and manufactured equipment and materials and confirming the supplier's quality management system. Source inspector electrical equipment will cover inspection of electrical material from junction boxes, control panels, electrical systems, transformers, switchgear, motor control centers and electric motors. Source Inspector Rotating Equipment is the second certification in the source inspector suite. This certification, developed within the industry experts, focuses include pumps, gears, compressors and turbines. Now, more than ever, our country needs qualified welders. It’s a fantastic career choice, filled with a variety of different career options and salaries. Whether you’re looking to change your career or you’re just starting out, becoming a welder could be the perfect fit for you.